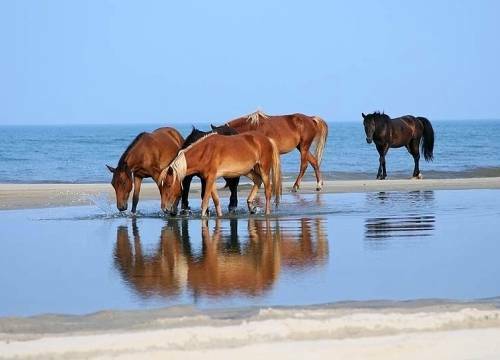 Horses have been found on Sable Island, off the coast of Nova Scotia, since the 18th century. Though hardy, the feral horses are dying; a team of researchers has been investigating the cause of the recent deaths. Dr. Emily Jenkins, one of the researchers, has discovered that the horses are perishing from starvation as well as from high parasite loads. In 2017, scientists landed on the 26-mile sandbar to find that 50-odd horses on the island had died over the winter. They were able to examine the bodies of 30 of the horses. The passing of the 50 horses was about 10 percent of the wild horse population on the island. The horses have not been studied from a veterinary perspective since the 1970s, so little was known about why the horses could be dying. Collecting samples from horses for research is also difficult as they are protected under federal law. However, a horse carcass is easier to gain permission to study and offers a wealth of insight into the horse's living conditions. Starvation was found to be a key factor in the horse deaths, especially for horses that were a year old; this age of horse has a have a lower social status in the herd and therefore less access to good grazing. In addition to limited forage, the horses ingest large amounts of sand while eating, which wears down their teeth and prevents them from chewing properly and obtaining all of the nutrients from their food. The sand can also cause intestinal blockages that are fatal. The researchers also found strangles-causing bacteria and lungworm in the carcasses; lungworm is traditionally associated with donkeys. There was no one main cause of equine deaths, but the researchers hope that the genetics of both the parasites and the horses can help aid in research on dewormer resistance in domestic horses. This entry was posted in Horse Care and tagged death, dewormer, Dr. Emily Jenkins, Nova Scotia, parasite, research, resistance, Sable Island, starvation, yearling by Paulick Report Staff. Bookmark the permalink.